We asked the industry what updates from Facebook's Developer Conference F8 they were most interested in, and the responses were AR, AR and more AR. At the conference on April 18, Facebook co-founder and chief executive Mark Zuckerberg announced the launch of an augmented reality camera effects platform. The platform will depend on external developers and the first effects will be available via Facebook’s Camera feature on smartphones. 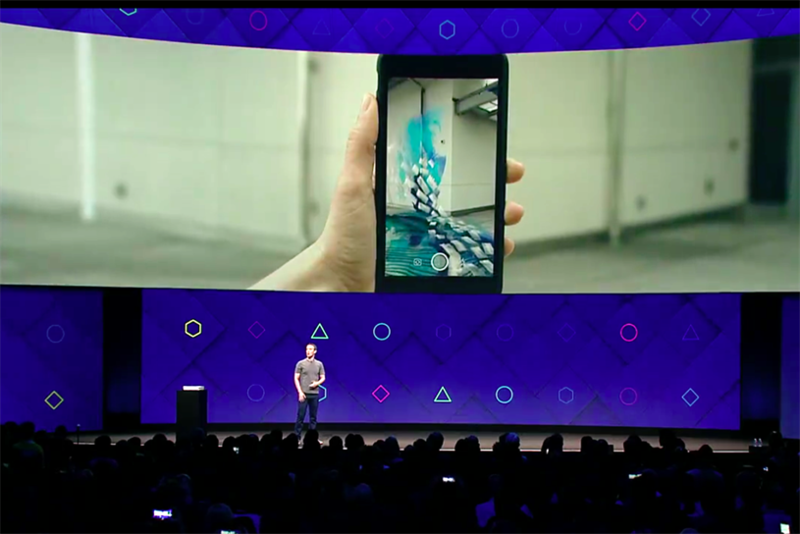 "The biggest story for me from Facebook’s F8 event this year has been the new tools for augmented reality, which clearly signal the social giant’s ambitions to become dominant in this area," Dan Calladine, global head of media futures at Carat said. Facebook, Calladine added, is beginning to treat the camera screen like a cursor—it’s what users start a session with, particularly with Snapchat and Instagram. By making it easier for people to create their own camera effects, both as simple frames for pictures or augmentations for which developers need to apply for access, it’s clear that Facebook is hoping that it will win the mobile war. The social media giant is clearly trying to accelerate mainstream adoption of AR by integrating Messenger into Facebook Spaces, enabling all users, and not only those that have Oculus Rift hardware, to use the service, said Kevin Chase, Fetch’s director of social for EMEA. AR is a big deal for brands because it allows them to layer information on top of the world around you to enhance the experiences we love to share, and making genuine, meaningful connections with brands, Charles Crotty, digital strategy director, Mediavest Spark noted. "It also has the added benefit of appealing to a younger audience, who are more difficult to reach through traditional media. This is something that companies like Snapchat have seen huge success with, especially as early applications of AR to the marketing process were severely limited by scale potential," he added. While Facebook hasn’t yet announced advertising opportunities for its AR platform, the potential is there for brands to get involved through the integration of both location and image-recognition, Calladine said. "Location would allow brands to offer effects to show that they are enjoying a meal somewhere, for example, and image recognition would allow them to virtually dress up as brand characters, or even trigger special effects when they see a logo," he added. Entertainment brands could host events in Facebook Spaces, Chase suggested. "For example, a brand could partner with Ed Sheeran to host a live show within the platform and fans with suitable VR products could attend the show and directly be a part of the experience, whilst the majority of fans could view a video of the show live in Messenger." While Facebook’s announcements do not have the noise of the Oculus Rift acquisition, they are nonetheless significant for the company’s ongoing ability to scale and dominate its space. "The announcements have been very much about scale, refinement and mass adoption of its products among the Facebook user base," Alex Smith, head of social and digital planning at Maxus UK observed. "By developing community further within Facebook through these innovations, the platform can keep users within its walls through richer more enhanced experiences, thus future-proofing its continued growth and most importantly user attention," he added. The evolution of the messenger platform and the launch of messenger platform 2.0, should not be overlooked, Smith said as these developments were part of Facebook’s core offerings of community and communication. "The challenge for Facebook is taking these new technologies from gimmicks that users try once to habits they adopt consistently," Michael Olaye, chief executive at Dare, said. "Socializing in VR is not necessarily a natural progression for people and VR headset adoption remains low. If the experience feels too strange and uncomfortable, this could represent an expensive failure for the social network. Yet given Facebook’s size and financial clout, this may be a gamble worth taking." We may even look back at these announcements as being as crucial as the original Like button, concluded Calladine.